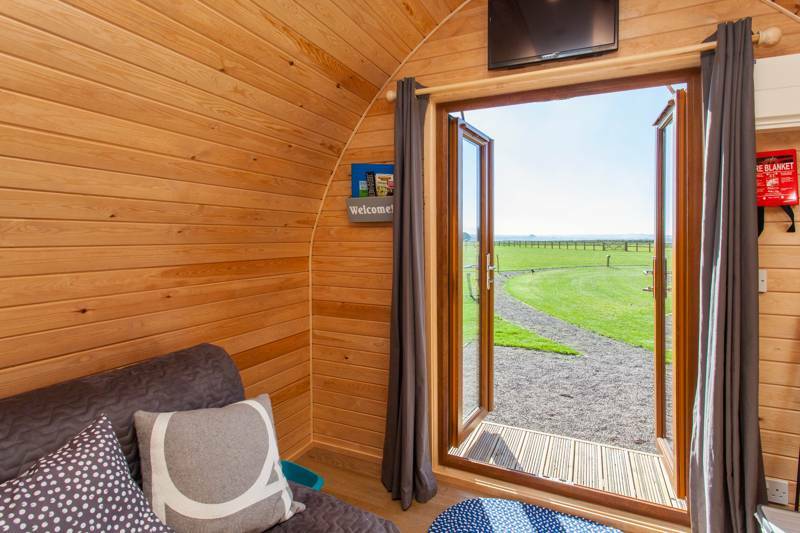 Each glamping pod is fully self-contained, well-insulated with double glazed doors and lighting inside and out, and contains a double bed and sofa bed. Pods are equipped with an en-suite bathroom and a fitted kitchenette, which includes a fridge with mini freezer compartment, sink, 2 ring electric hob, toaster, kettle and a microwave. You will find cutlery, crockery, saucepans, bbq set and utensils. Your bed linen and towels re also provided. Underfloor heating is installed to ensure maximum comfort during your stay. Not only do you have a foldaway table and chairs inside the pod, out the front you will find your own seating area, with a picnic bench and a personal steel fire pit/barbecue, all overlooking our breathtaking scenery. There is a Pentaque area and a small adventure playground to keep you amused or perhaps you would rather hire an electric bike and take in the scenery around, which we can easily arrange hire for you. We also have WIFI available for you to connect to. Rankins Farm, a peaceful holiday destination in the heart of the Kent countryside. Owned by the Sunnucks family since 1963, the estate was a working farm until 2017, and now provides first class accommodation for visitors to this beautiful county, with a small amount of top fruit farming still going on. Whether you are planning a weekend getaway or a fortnight’s holiday with the family, you’ll find a wonderful experience waiting for you at Rankins Farm. All pods are en-suite (shower, toilet, washbasin, heated towel rail, toiletries, towels e.t.c.) and sleep up to 4 people on a double bed and a pull-out sofa bed (bedding and linen provided). Each pod has underfloor heating and a compact kitchen space with a microwave oven, 2-ring hob, sink, fridge, pots, pans, crockery, cutlery and utensils. There is also a fire pit for BBQs and campfires outside, with wood sold on site. The glamping site has a small adventure playground and a boules pitch, with games such as giant jenga and badminton also available to use. Tony and Sarah can also help arrange electric bikes to hire if guests want to cycle around the area. We also have WIFI throughout the site. As the landing point for European invaders, Kent is home to heaps of castles, a handful of which are within easy reach of Rankins Farm. One of the best kept is Leeds Castle (01622 765400), a mere 7 miles (15 minutes by car) away. Dating back almost 900 years, the castle has undergone a series of makeovers, from a Norman stronghold to a Tudor palace, to a privately owned home during the Jacobean era. It also served as a place of detention for Dutch prisoners of war in the 17th century and a hospital in World War II. Today, the 500-acre estate greets over 200,000 visitors a year, with activities during school holidays. Moated Bodiam Castle (01580 830196), built during the hundred years’ war, is a half-hour drive and still retains such features as wooden portcullis and a look-out tower that you can climb, with guided walks available. Hever Castle (01732 865224), childhood residence of Anne Boleyn, is also 45 minutes away, while the 460-acre Sissinghurst Estate (01580 710701; 18 minutes drive) is more renowned for its gardens than the building itself. For further culture, it's a 15-minute drive from Rankins Farm to Maidstone, home of the Maidstone Museum (01622 602169), where highlights include a Solomon Island canoe and an excellently preserved Egyptian mummy, and the Tyrwhitt-Drake Museum of Carriages (01622 602838), from horse-drawn sleighs to the original ice cream cart. Maidstone's town park, Mote Park (01622 602169), is also great for families, with two children’s play areas, a free BMX track and a host of walking and cycling trails. For a real breath of fresh air, though, drive the 25 minutes to Bedgebury Pinetum (01580 879842), home to one of the world’s largest conifer collections and a fantastic place for family picnics or to Bewl Water (01892 890000), an 800-acre site that's a boon for wildlife lovers (be sure to bring your binoculars). The Kent Downs AONB is also on the doorstep, with the Pilgrim’s Way the best known of the local walking routes through the area. Supermarket deliveries to the glampsite are welcome if you want to use the pods kitchen facilities. Located a mile up the road on Linton Hill, The Bull (01622 743612) shares the same spectacular views as the farm, and is the ideal place to enjoy a drink in summer. The bar serves cask and keg ales from Shepherd Neame, and there’s a cosy restaurant too (traditional carvery on Sundays). For gin aficionados, Stile Bridge (01622 831236), a mile in the opposite direction, offers tasty food, cask ales and wines, as well as its impressive gin collection. There's a patio in summer and a roaring fire inside in winter. If you like your booze straight from the source, though, The Musket Brewery (01622 749931) in Linton (1.2 miles) started production in October 2013 producing fantastic Real Ales using the finest malts and Kentish hops. They have now opened The Armoury which is open on a Friday (16:00–20:00ish!) and Saturday open 11.00am - 20:00ish! For wine, try the Hush Heath Winery (01622 832794), the only English vineyard dedicated to the production of rosé sparkling wine. A range of tours and tastings are offered to visitors all year round, with guests invited to try the wines and ciders, and dine at the estate’s pub, The Goudhurst Inn (01580 211451). Leave Maidstone in a southerly direction following sign posts for Hastings on the A229 (Sutton Road and Loose Road). Drive through Loose village on the A229 to the Linton crossroads. Continue straight on down Linton Hill, passing The Bull pub on your right hand side. After ¾-mile turn right into Rankins Farm (if you reach the Stile Bridge pub, you have gone too far). Go up the main drive and follow the farm road round to the right – there are signs directing you to the glamping site car park. Staplehurst station and Marden station are both around 5 miles from Rankins Farm but from there you'll need to take a taxi. 6 en-suite glamping pods, each sleeping 4 people (2 adults and 2 children).